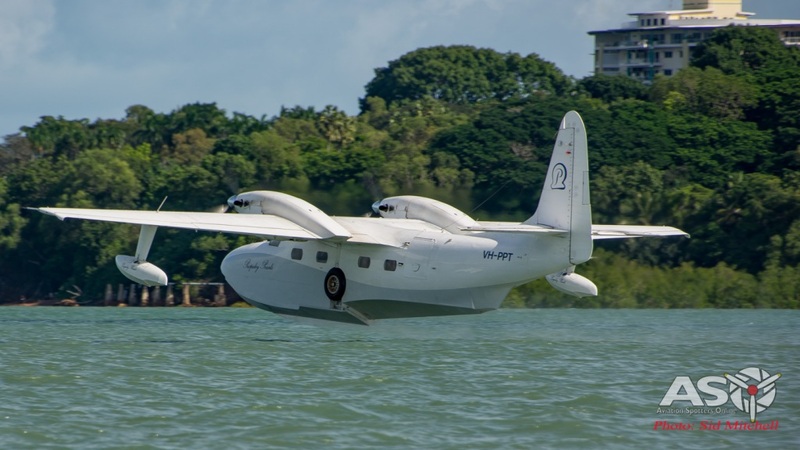 If you have ever spent some time in Darwin since the 1990’s, you might have seen the occasional Grumman Mallard coming and going from Darwin International Airport. 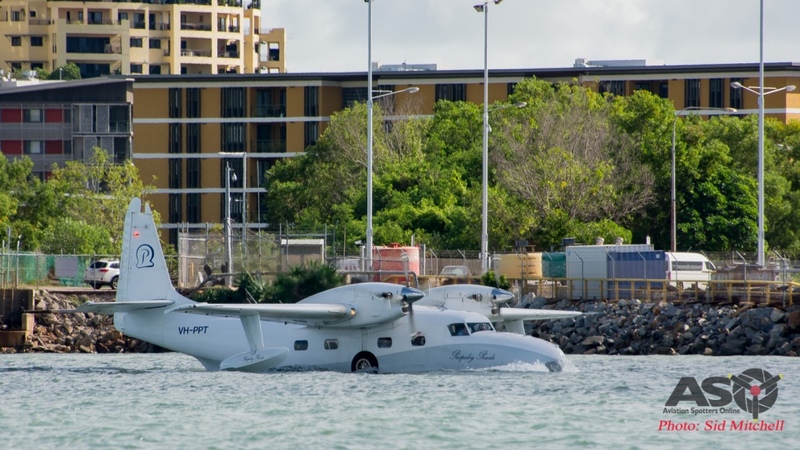 If you recently happened to be down at the Darwin Wharf Precinct or on Stokes Hill Wharf then you may have seen one of these classic amphibious aircraft operating on Darwin Harbour. VH-PPI on final into Darwin, Northern Territory. 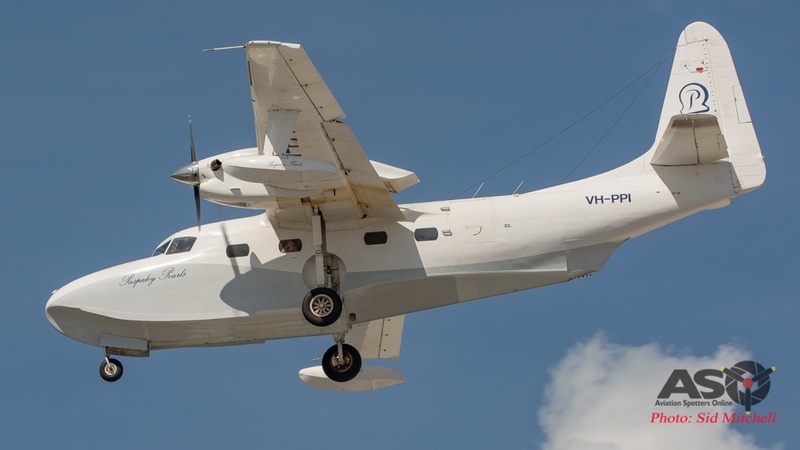 VH-PPI preparing for night operations – Darwin. 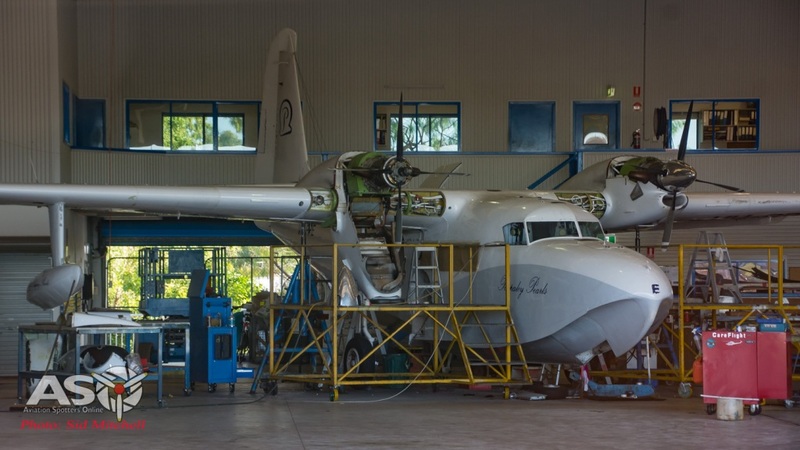 Iconic Australian South Seas pearling company, Paspaley Pearling Company, operates a fleet of three Grumman G-73AT Mallards from it’s hangars at Darwin International Airport, servicing their Kimberley based pearling operations. 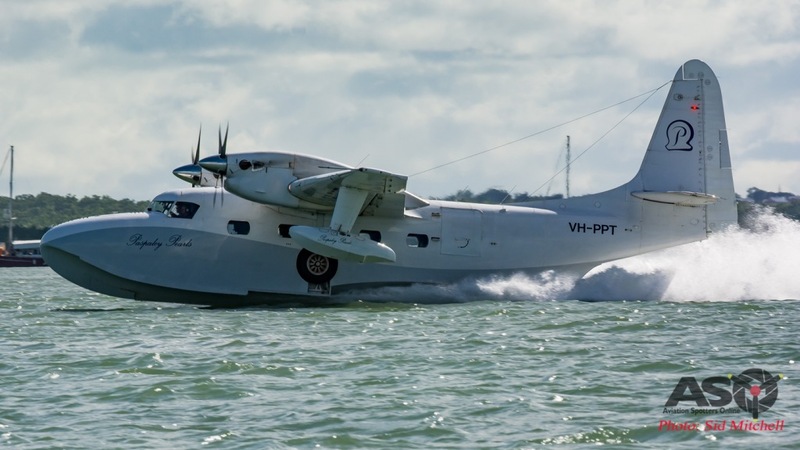 I was fortunate to be invited aboard one of their Mallards to experience a unique aspect of Australian aviation – the world of amphibious aircraft operations. Gruman Mallard VH-PPE in it’s element. Arriving at the Mallard hanger at the general aviation area of Darwin Airport, I was met by Daniel, a Mallard first officer at Paspaley Pearling Co who had arranged for my visit. We wandered in to the hangar where VH-PPE was up on jacks undertaking some maintenance – nose wheel and doors removed, engine access panels open, as were numerous other panels and lower belly sheeting. 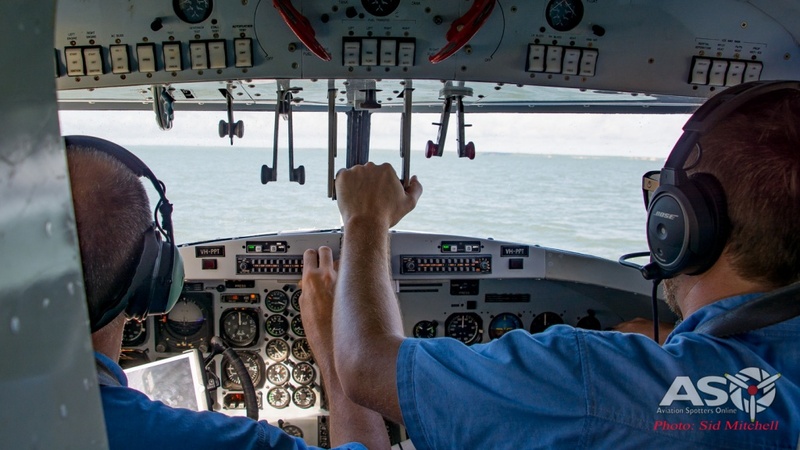 As with all amphibious aircraft, sealing, corrosion, lubrication of moving components is a never ending maintenance task, especially those that operate in salt water environments. VH-PPE under going maintenance in the Paspaley hangar. A little history around the Grumman G-73 Mallard – originally designed in 1944 Grumman built 59 aircraft between 1946 and 1951. 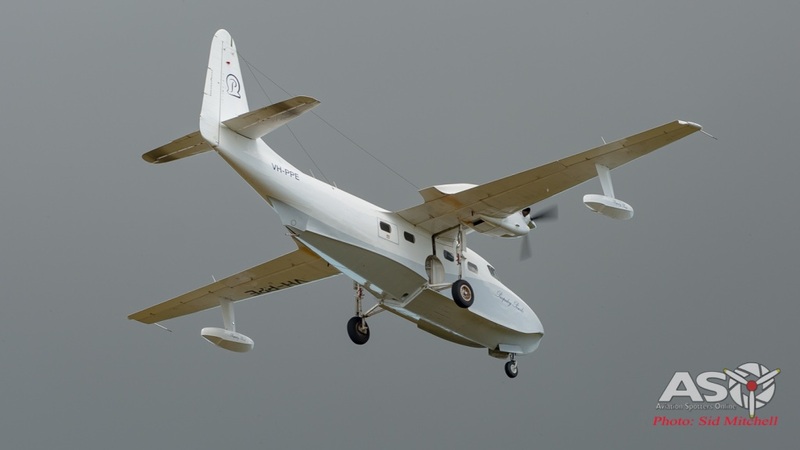 The G-73 was a step up from the smaller Goose and Widgeon aircraft having a larger passenger capacity, additional fuel in wingtip tanks, a double stepped hull, fully stressed skin and tricycle undercarriage. 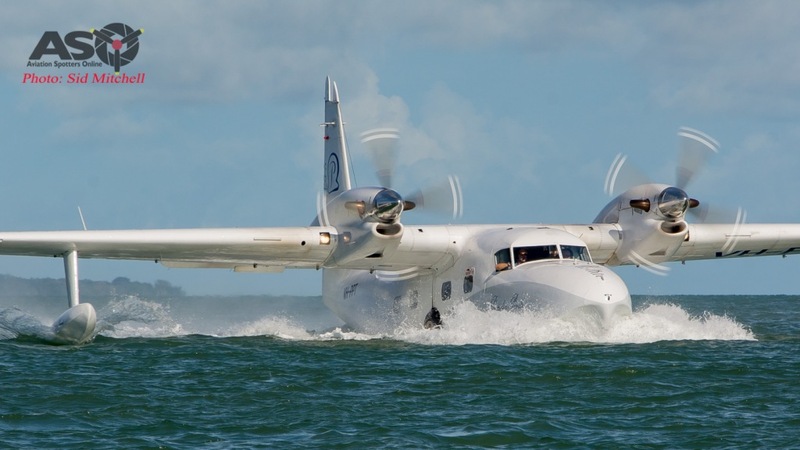 Although the Mallard was initially expected to serve in small harbour based airlines, it’s major operations extended into the corporate and private sector, providing a level of luxury air travel for those that preferred an amphibious option to their flying destinations. Powered by the Pratt and Whitney R-1340 radial, the Mallard soon established itself as a reliable, stable, strongly constructed aircraft and was liked by all that flew her. During the 1960’s the idea of re-engineering the aircraft produced the modified Frakes G-73T Turbo Mallard, powered by the Pratt & Whitney Canada PT6. 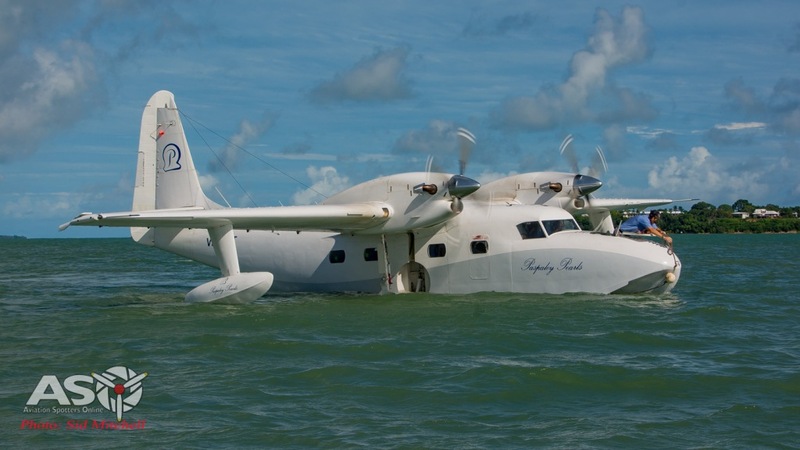 The Paspaley Pearling Co fleet of Grumman G-73AT Mallards. In a further model development the three Grumman Mallards of Paspaley based in Darwin underwent the Pearl-Aviation G-73AT Turbo Mallard program at approximately $5 Million which saw a renewing of the airframe life and installation of new engine nacelles housing PT6A-34 turbines, plus the associated engine instrumentation. The new turbines also drive 4 blade Hartzell propellors which improve performance of the aircraft both on water and when airborne. 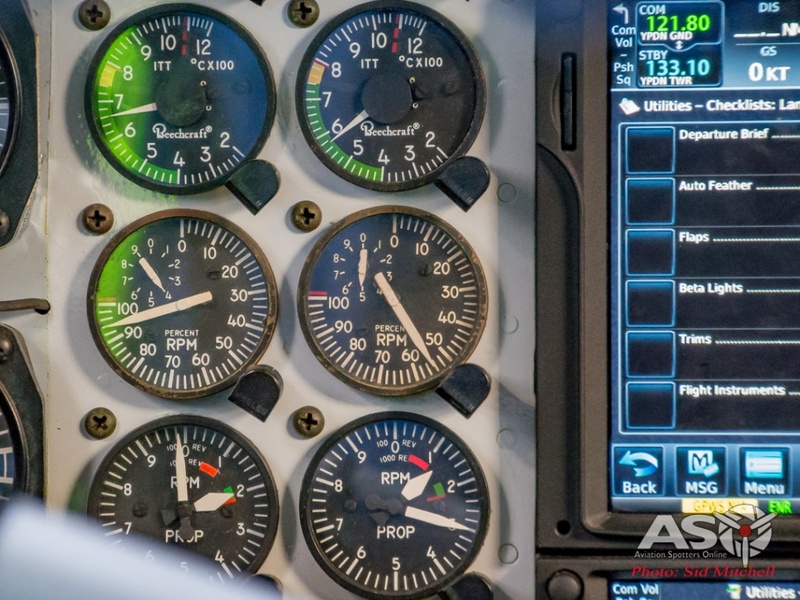 Additional modifications are constantly being implemented by Paspaley such as updated avionics and navigation systems. 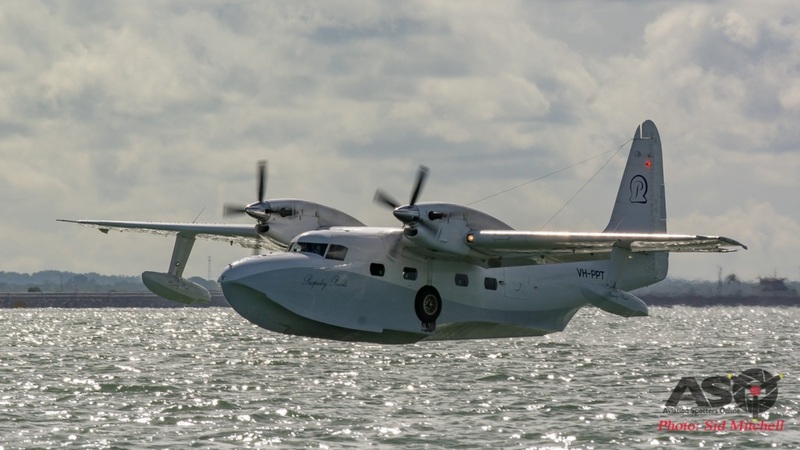 Original airframe serial numbers J22, J23 and J26 are now registered to Paspaley Pearling Company as VH-PPE, VH-PPI and VH-PPT, all having been constructed in 1947. Not bad for a 70 year old aircraft that still has parts available, others that can be refurbished and with an ongoing inspection and maintenance program, has a long airframe life ahead. Waiting out on the apron was our ride for the day, VH-PPT, the youngest (by only months) of the three aircraft. 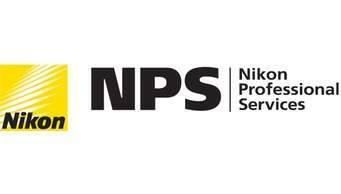 Wet weather – not a problem. After meeting Andrew, Pete, Taiki, also chief and line pilots at Paspaley hangar, we climbed aboard PPT to perform a short taxi to the Pearl Jet Centre. 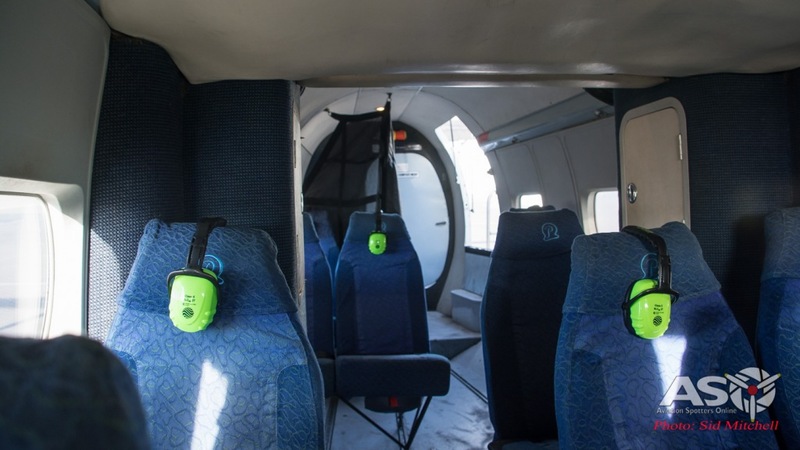 The interior is surprizingly spacious and is two-tone cream and light grey with the cloth seating finished in a dark blue and the Paspaley Pearl logo on the headrest cover – quite nice considering a fair amount of the operations involve flying employees to and from the Kimberley locations. The normal seating capacity is 13 in a 2-1 and 1-2 arrangement, plus two crew of course. Mallard interior furnishings – 13 seats plus two crew. After I get seated, Daniel goes through the safety brief and offers me a headset to listen in on procedings. Andrew and Daniel get seated up front and I listen in on them stepping through their checklists. 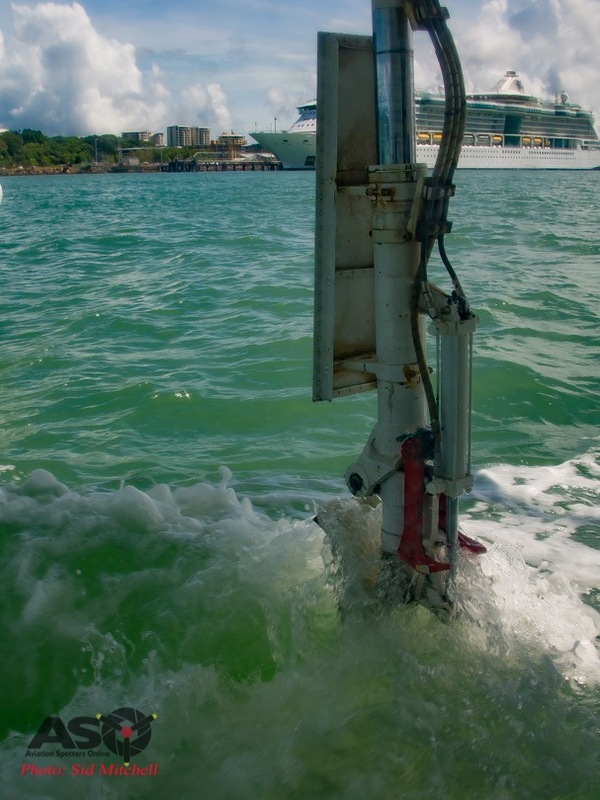 With the all clear they start first the starboard then port turbines, after which Bob removes the auxiliary battery cart cable so we are good to go. PT6A-34 turbine and 4 blade prop – part of the Paspaley upgrade. 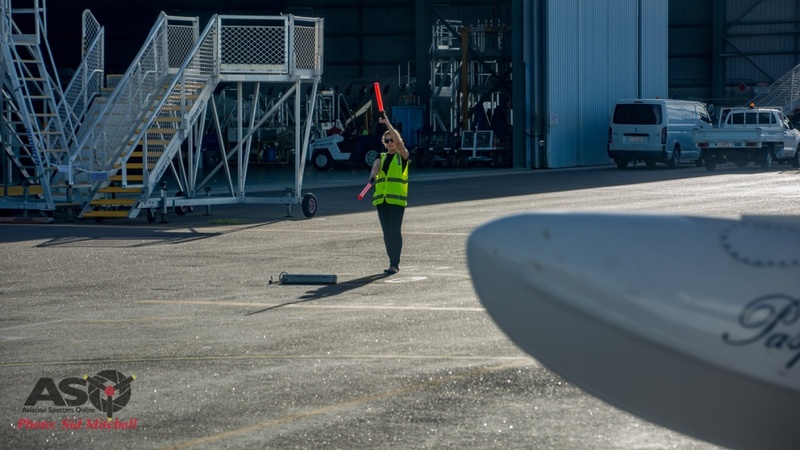 With land taxi checklist completed we taxied out to the parking bay where each turbine is wound up and checked before we continue on around to the Jet Centre. Cranking up the port PT6A-34. Taxi via the parking bay. We are marshalled into parking by Jess to pick up some additional Paspaley employees including General Manager, Tony, Jenna the Commercial Development and Operations Manager – red carpet treatment is standard at Pearl. 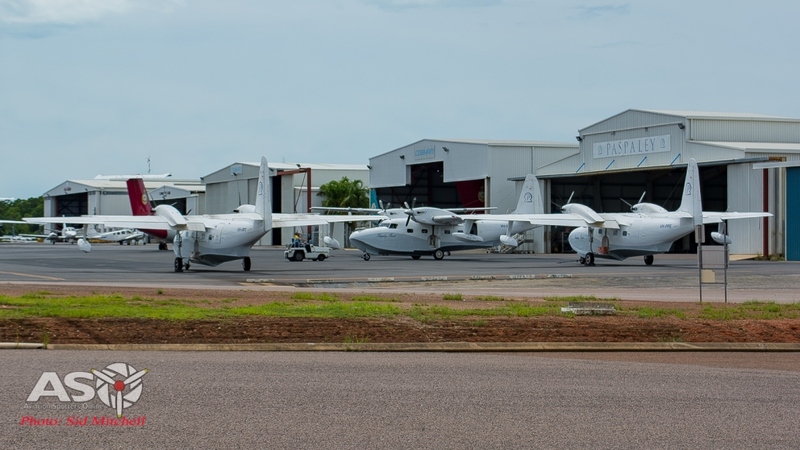 While waiting I find out that the pilots have quite varying flying backgrounds, some have previous floatplane or amphibian type experience and some undertake conversion to Mallards here in Darwin. 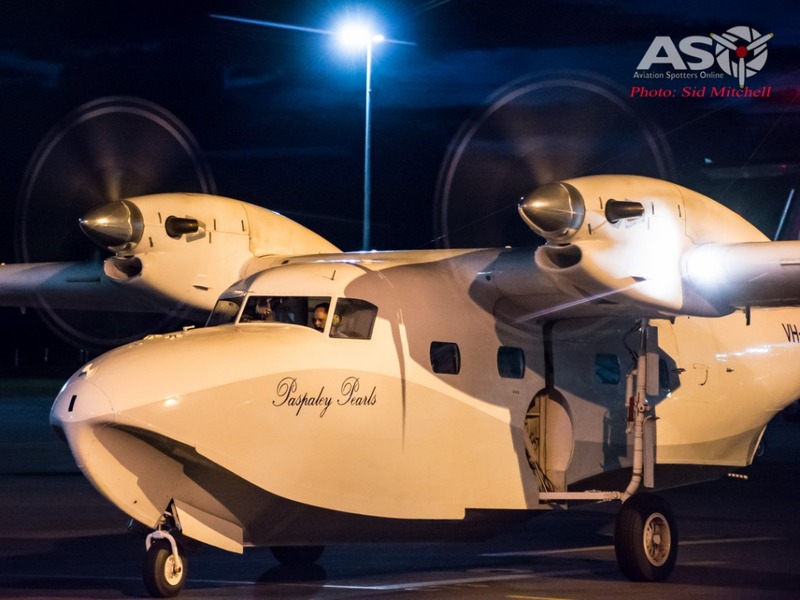 A lot of float and amphibian pilots gain valuable experience in Canada or the US/Alaska region where these types of aircraft are more prevalent. Marshalled into the Pearl Jet Centre. 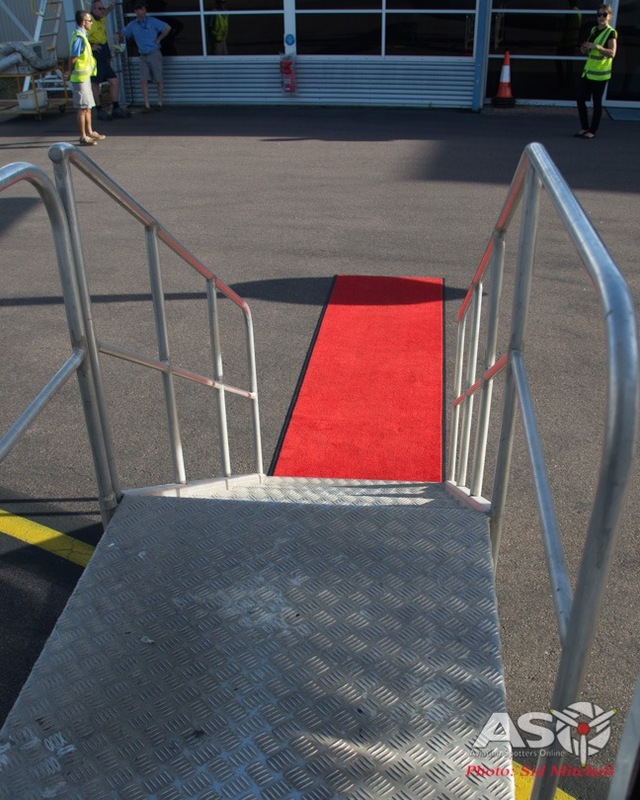 The red carpet treatment…but not for me. 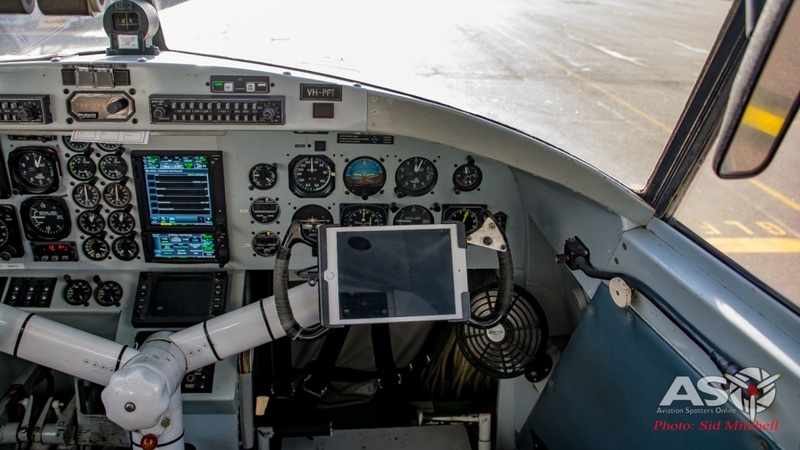 With a few minutes before we depart, I look into the cockpit and see the obvious changes to the instrument panel. Gone are most of the original gauges, replaced by modern instrumentation including the vertical engine instrument cluster, what I did notice was what looked like the original combined flap-position/undercarriage indicator – a touch of functional nostalgia, why not? 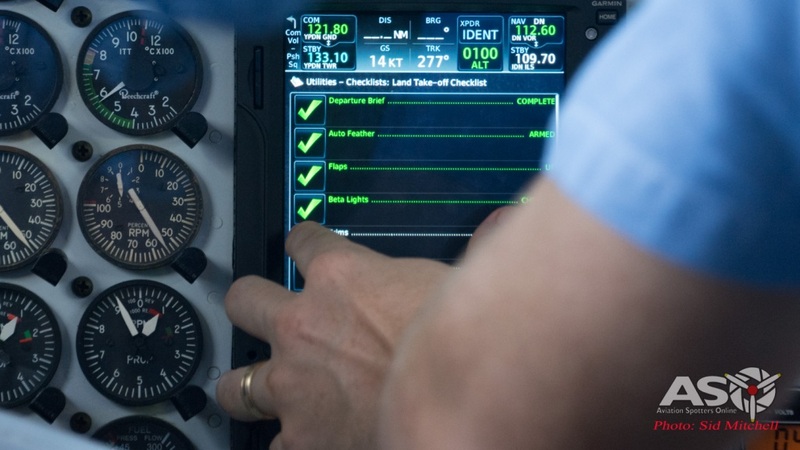 Centre stage is the Garmin multifunctional navigation display which I saw the guys use to tick off the various checklists. 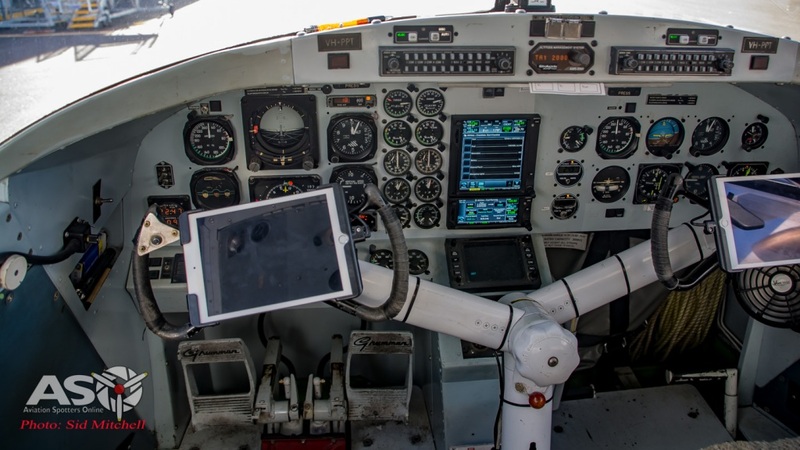 IPad/Tablets on each control column yoke are often the standard these days, but it was also great to see the overhead panel was looking quite authentic. 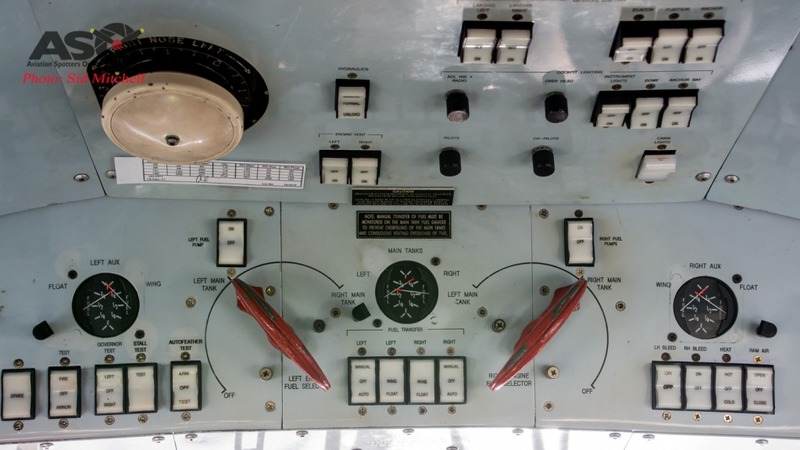 This panel houses electrical controls, engine fuel selectors and gauges, plus the underslung throttle/pitch quadrant levers. One of those quirky features of the Mallard is located behind the copilot’s smaller rudder pedals – the access passage to the forward compartment. This is where Daniel will later crawl to open the front deck hatch which will allow him to secure the mooring line. 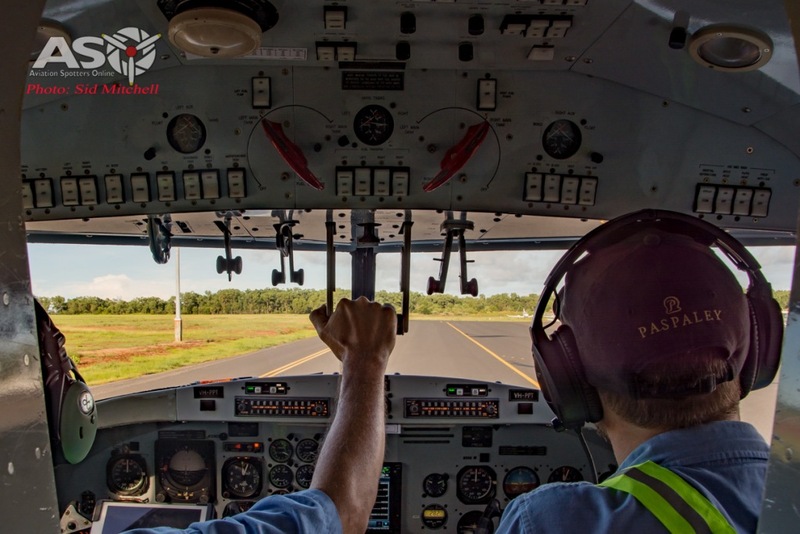 Copilot position with forwad compartment access over the rudder pedals. With Andrew and Daniel up front going through the engine pre-start checklist again, Pete was busy answering questions about the Mallards for us first timers as we taxied out for a Runway 11 departure. After a short roll VH-PPT climbed out for a left turn to follow the coast at around 1000′ heading for our Darwin Harbour landing. 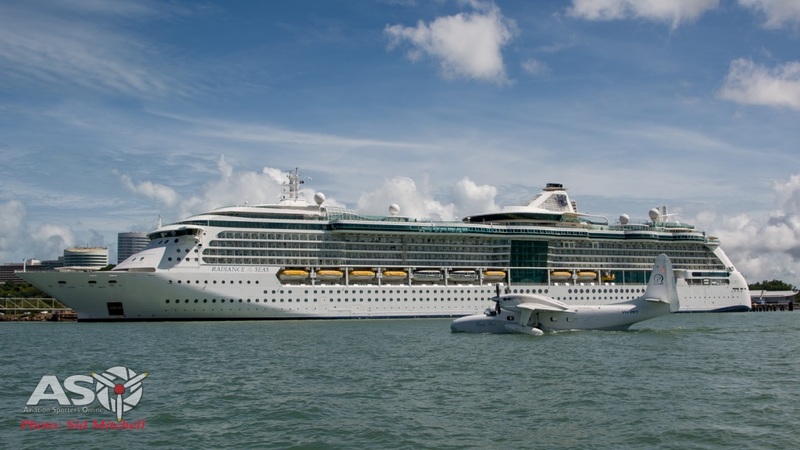 Soon we would be landing next to the cruise ship Radiance of the Seas docked at the Darwin Cruise Ship Terminal. Today we were checking the logistics in picking up passengers from a cruise ship, transferring them to and from a Mallard by tender, departing and returning to the harbour after a scenic flight, and back to the wharf (ship) by tender. 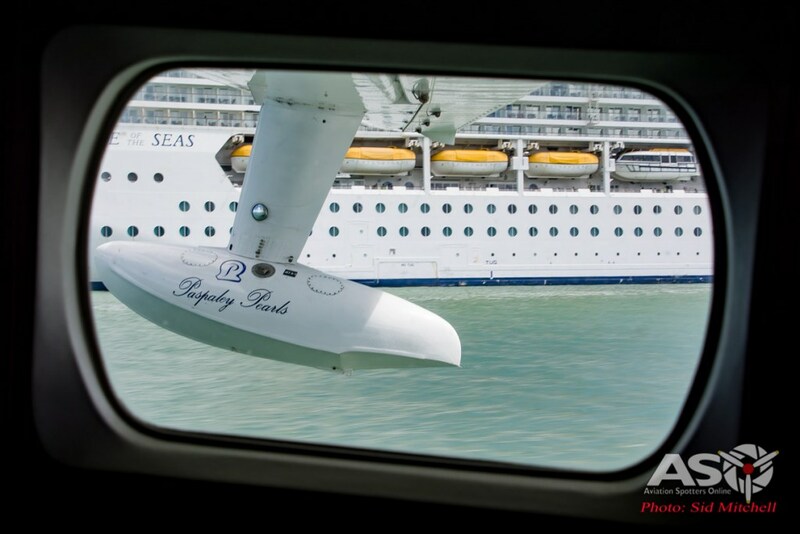 As we reduced altitude I could see Brad in the Paspaley tender powering out past the cruise ship to the mooring point a few hundred metres offshore. Brad powering out past The Raidiance of the Seas to meet us. 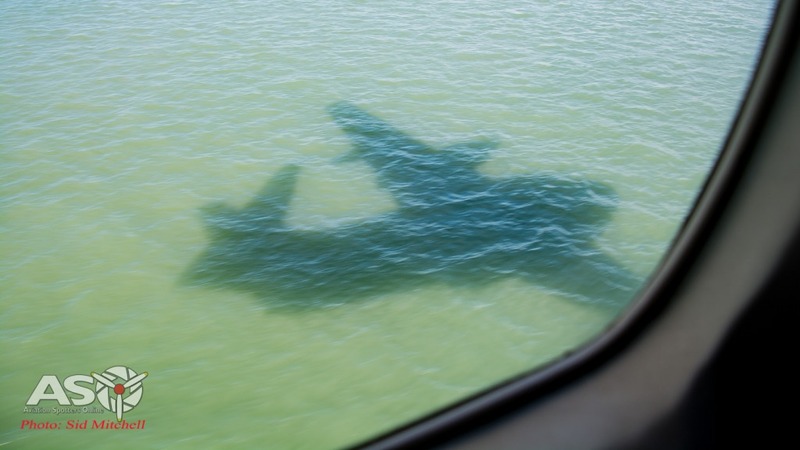 After a final descending turn into wind, VH-PPT gracefully touched down on the green waters of Darwin Harbour. 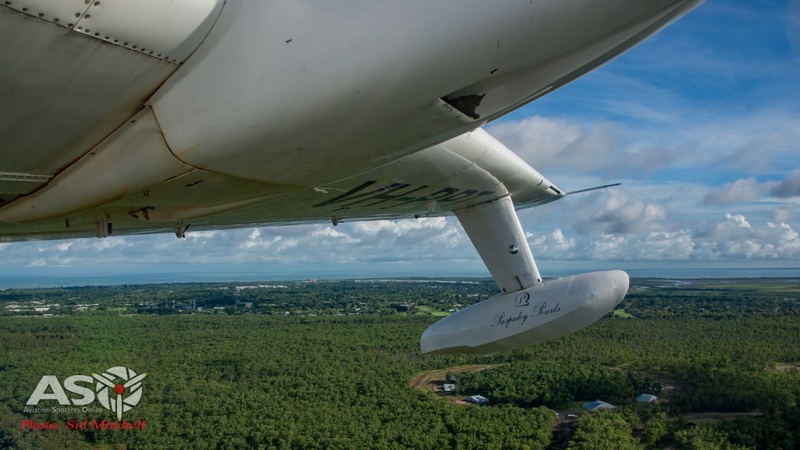 It was interesting to hear the communications on the radio – needing to talk with both Darwin Tower and Darwin Harbour Control to co-ordinate the takeoff and landings with aircraft and waterborne traffic hazards. 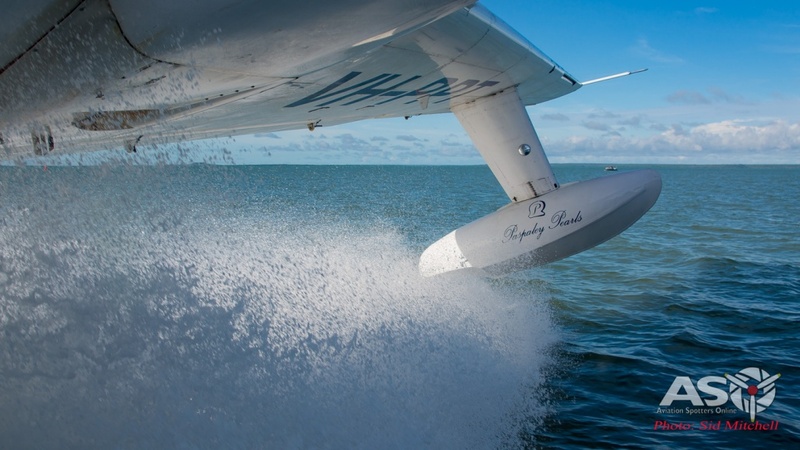 Having never been in an amphibian aircraft before I was quite surprised how quiet and smooth the landing was – some initial bumps and noise from the hull but that soon reduced to just the hiss of water being sprayed out with the turbines in the background. A distinct profile from 20′ up. 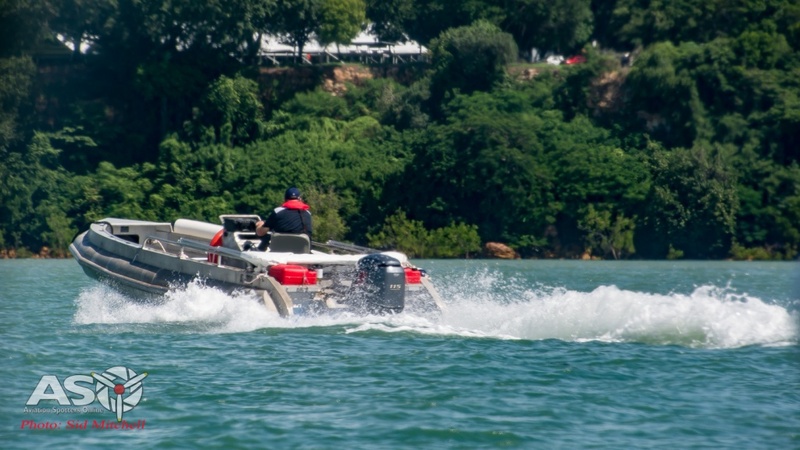 As we were required to disembark from the port side, Andrew cut the port engine while Daniel went to the rear and opened up the passenger door and assisted Brad bring the tender along side. It’s not often that you hear the term ‘bilge pump on’ used in an aircraft, however it seem quite appropriate for a Mallard. Slow taxi to passenger transfer position. 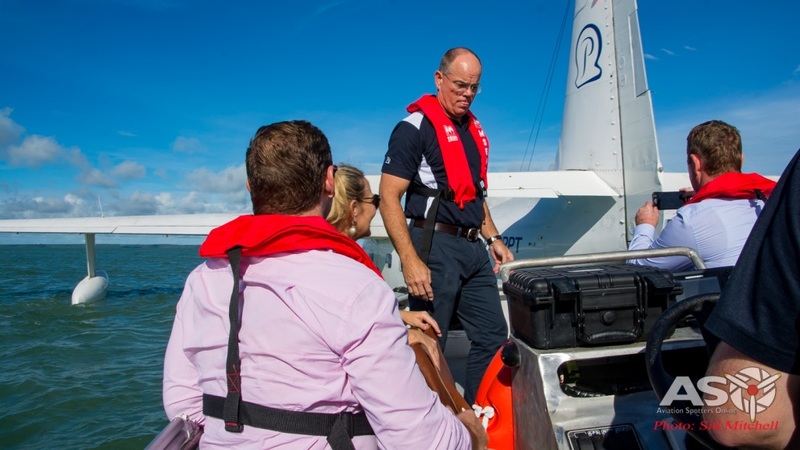 Donning life preservers all passengers alighted to the tender for the short trip into the wharf where they were to visit the Darwin Cruise Ship Terminal. 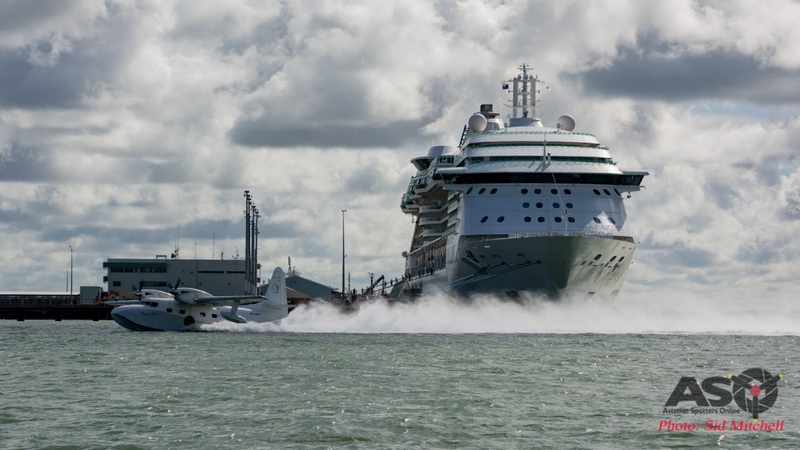 For me it was a chance to go back out on the water and take some photos of PPT taking off and landing across the bows of the Radiance of the Seas. 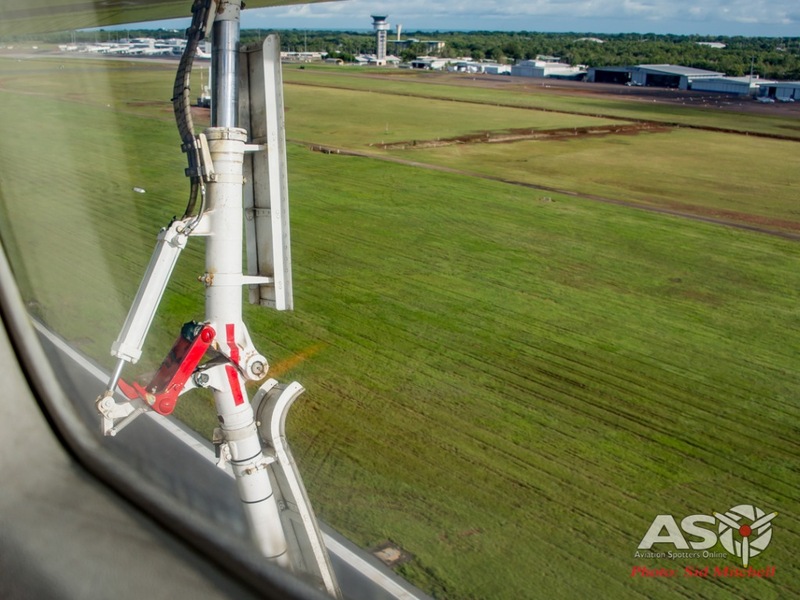 Reversing out – watching our heads on the tailplane. Brad positioned us near the mooring point and we watched the guys taxi the Mallard downwind past the liner. A quick 180 degree turn into wind and they soon had the PT6A-34 turbines wound up and VH-PPT on the plane, lifting off with the Darwin CBD in the background. A quick circuit of the harbour and they were lined up for the approach and landing. Watched by some passengers aboard the ship, the Mallard touched down on the silver waters, flaring and finally slowing to a few knots taxi speed. As the aircraft was to be moored for a while, the guys were to tie up to the mooring point and soon had the Mallard closing in on a float. Daniel had climbed through the access under the co-pilot dash after raising the rudder pedals, and into the forward compartment to open the front hatch. Daniel ready to recover the float. While Andrew manipulated the throttle/pitch controls to combat the outgoing tide and incoming breeze, Daniel armed with a boathook, retrieved the float and tied off PPT. 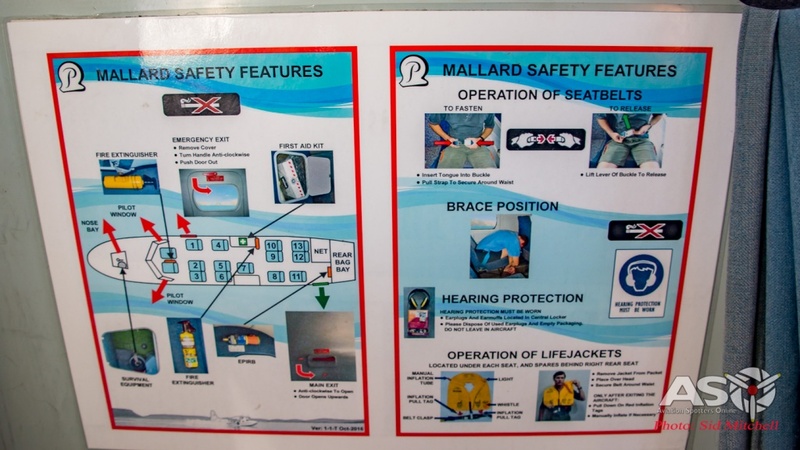 Naturally the Mallard crews are not just aviators but have to take on the role of mariners at times. They made it look so easy but with all the practice they have over in the Kimberley bases securing up to pontoons and buoys it wasn’t surprising how quickly they had moored VH-PPT. I noticed the main undercarriage extended and Daniel explained later that it helps with handling by creating some drag. 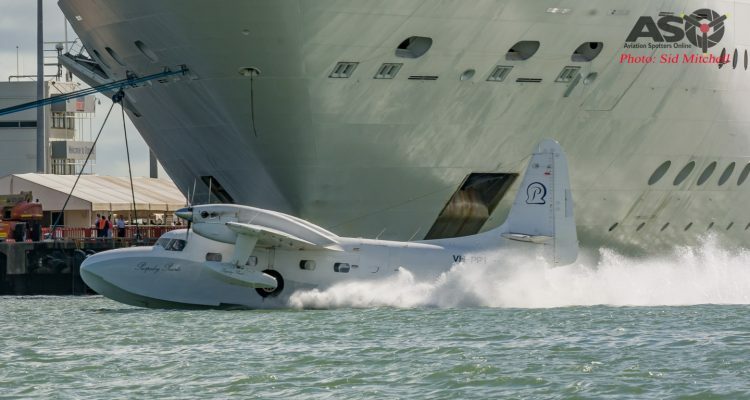 The hull is very ‘slippery’ and the exhaust from the PT6A-34 turbines actually creates some forward trust, even with the props feathered, so a little extra drag is an advantage on the water. Retracting the mains while tying off to the mooring. 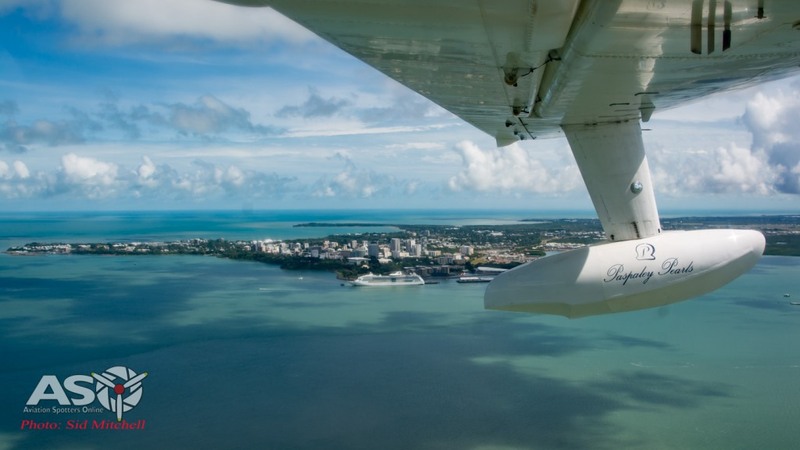 The Paspaley crew climbed aboard the tender and with passenger door left open to ventilate, we headed off to the wharf leaving the aircraft to swing on the mooring. 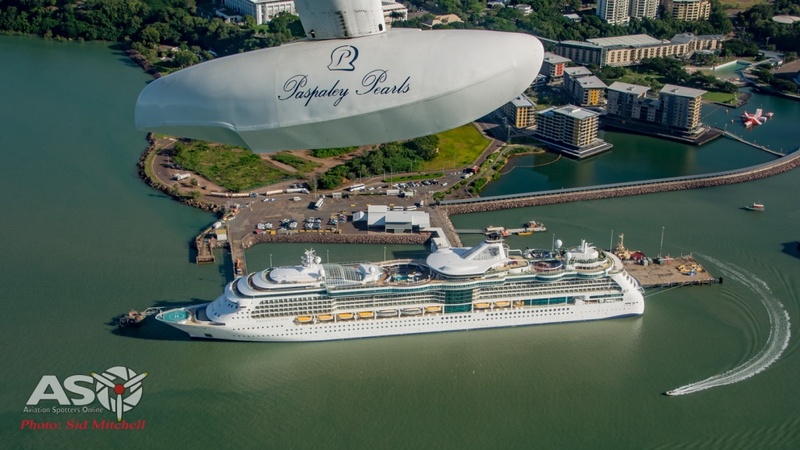 After a stroll through the arrival hall in the Darwin Cruise Ship Terminal and seeing all the tourists heading into Darwin on various tours to do some shopping, it was time for a leisurely cruise back to the aircraft. 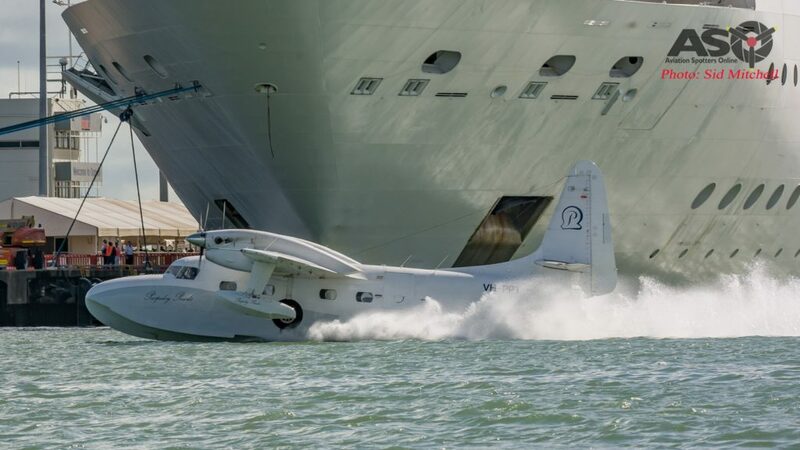 With some time to spare it was decide VH-PPT would perform a last taxi past the cruise liner for a photo opportunity before I had to jump aboard. 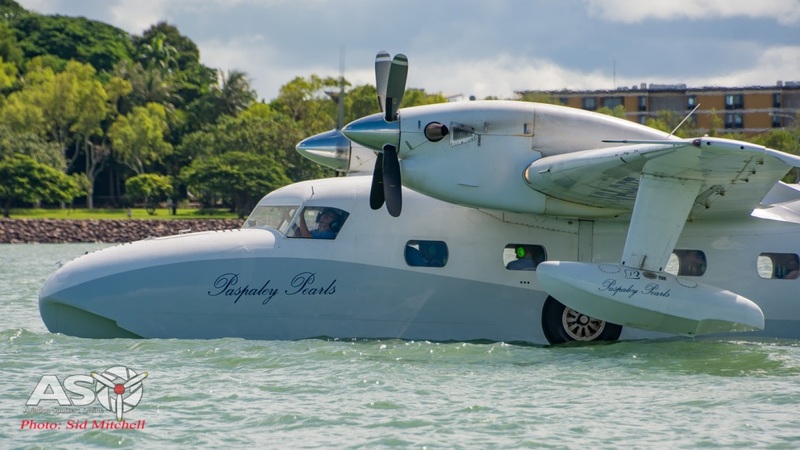 Leaving Brad to take the tender back ashore, it was just myself and the Paspaley team to take the short flight back to Darwin Airport. 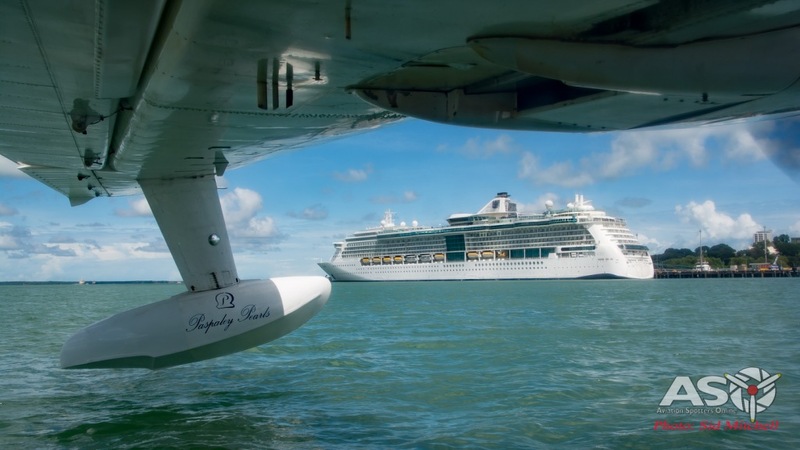 We performed a final downwind taxi past the Radiance of the Seas and tuned into wind. Our water taxi for the day. This flight I had a different seat and as we taxied I could see the definite drag affect the mains had before they were retracted for take-off. A quick thumbs up from Andrew and we were away. Take off was pretty much the opposite experience of landing, except with a little more noise from the PT6A turbines. I watched the wake dissipate through the window (porthole?) as we rose onto the plane and with one or two bumps were airborne once again. 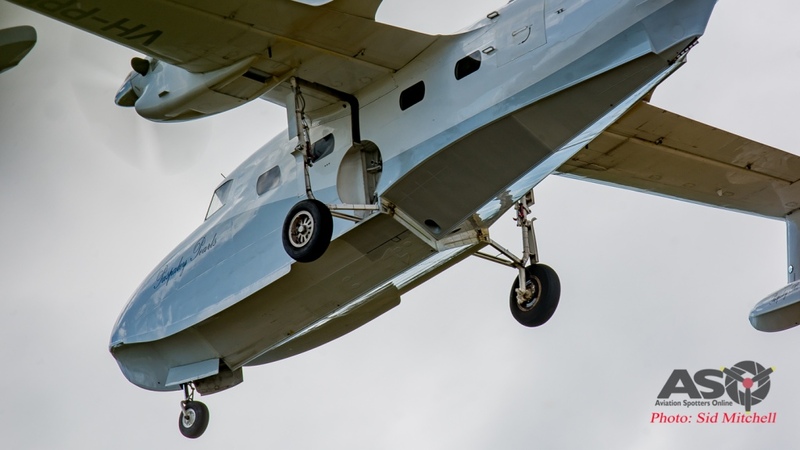 I fly quite often and the one thing I did notice this time was the absence of bumps or clunks from the undercarriage stowing away. I guess thats floatplanes for you. 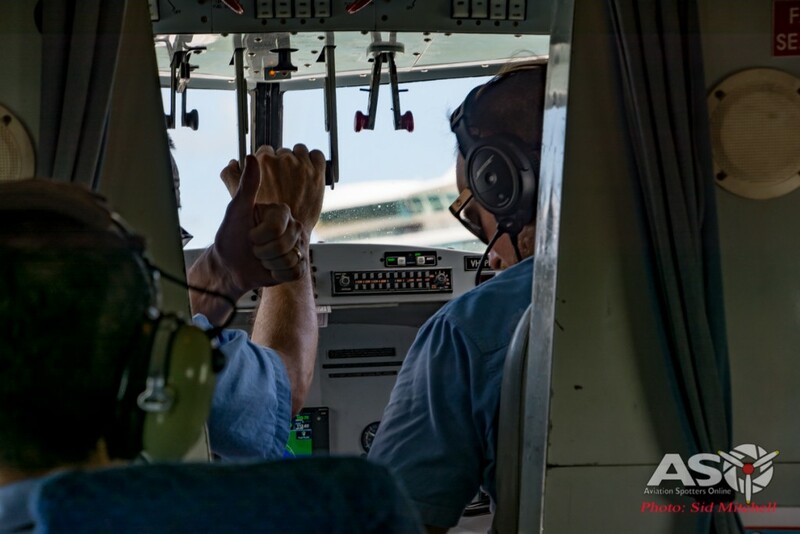 A swing of about 270deg around to the left and the guys had us almost lined up on the shorter Runway 36 – gear down, flaps and soon after crossing the Stuart Hiway we touched down and rolled out. A bit of a roundabout taxi to the Mallard hangar due to some ground traffic and we parked on the spot from which we departed earlier. Wandering back through the hanger I see VH-PPE with parts removed and panels open everywhere. 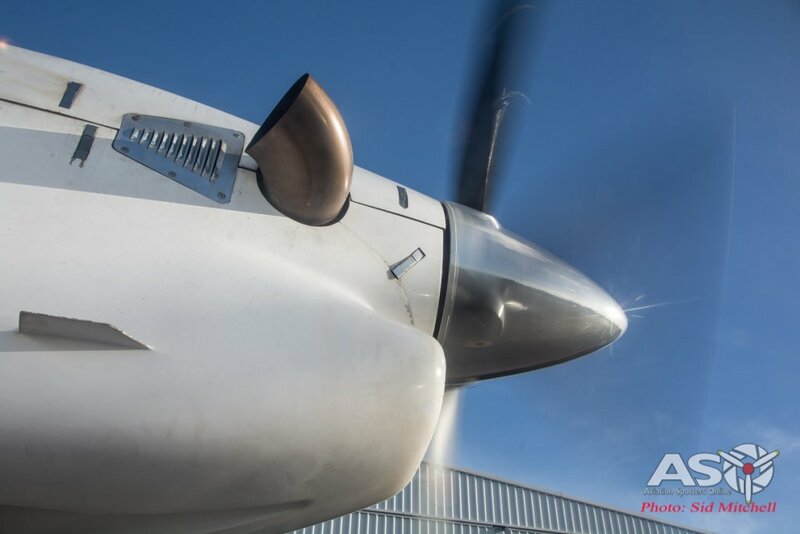 Pete had earlier explained the aircraft are removed from service for 100 Hourly maintenance – and of course major maintenances are performed over longer timeframes. 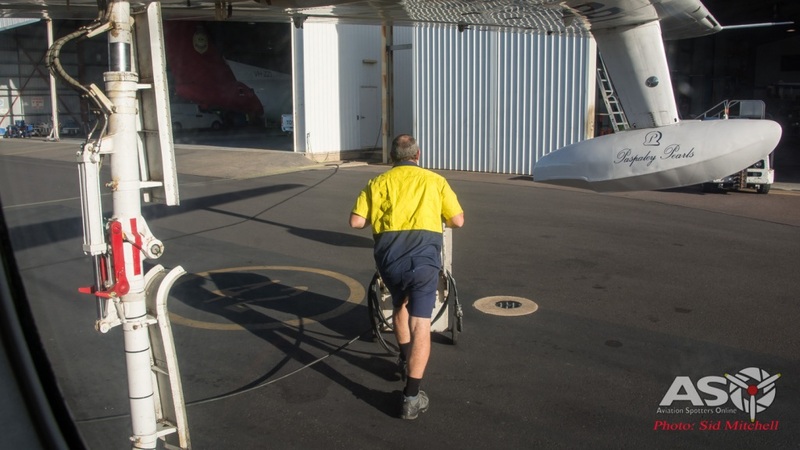 Each time the aircraft is thoroughly inspected for corrosion and in the case of PPE, was having some lower hull skins replaced with the maintenance guys doing their utmost to have her ready to take to the air again as scheduled. The Grumman G-73AT Mallard in it’s element. With a final thanks to Daniel and Jenna for organising the day, I depart thinking “well…that really was a unique way to spend a morning”. Although a good part of my day was looking through a lens, going over the pics I see minor details I missed that I might have seen if I was just along for the ride, ahh well, maybe next time. So is it a better vessel or aircraft? – I guess Grumman got the mix right back in the 40’s, as it seems to be just at ease in both environments. As for looks, well, personally I think the Mallard has classic lines that will endear pilots and passengers for many years to come…. I know the folks at Paspaley are pretty chuffed with them. 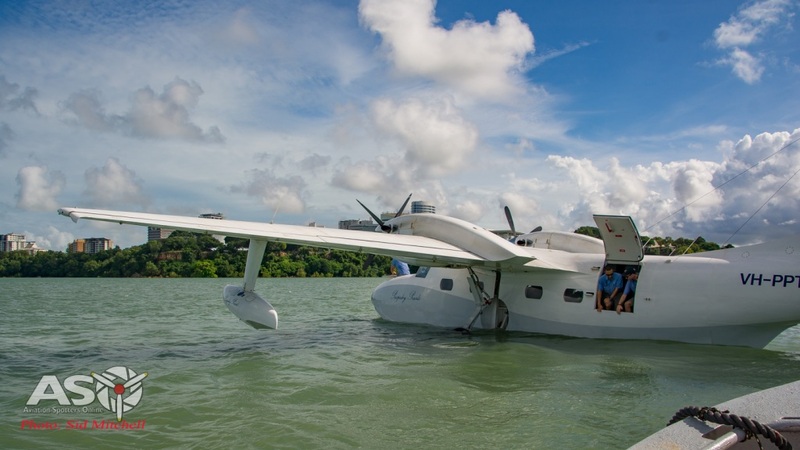 And for those that have never flown in an amphibian, if you ever do get the opportunity, take it, for it is so much different to your regular flying experience. A big thanks must go to Paspaley Pearling Company, Daniel, Andrew,Pete, Jenna, Brad and Taiki for humouring me all morning – so until next time. Great work Sid, was a pleasure having you on board! Thanks for the kind words Alan, they are a lovely aircraft indeed. Great article Sid, thanks for sharing your WOW experience in particular up against the cruise ships, I’m envious of your day. Such an amazing aircraft & the pilots too!